Three cats have tested positive for the deadly strain of bird flu in Austria's first reported case of the disease spreading to an animal other than a bird, state authorities said Monday. The sick cats were among 170 living at an animal shelter where the disease was detected in chickens last month, authorities said. The World Health Organization called bird flu a greater global challenge than any previous infectious disease, costing global agriculture more than $10 billion and affecting the livelihoods of 300 million farmers. Meanwhile, U.S. health officials announced plans for a second vaccine to protect people from bird flu because the virus that is spreading among birds in Asia and Europe has changed significantly in the past year. The government has several million doses of an earlier bird flu vaccine, but it was based on a sample of virus taken from Vietnam in 2004. The germ is believed to have mutated enough since then that the form now circulating in Africa and Europe may be different, health officials said. U.S. Health and Human Services Secretary Mike Leavitt said Monday he had authorized the National Institutes of Health and the federal Centers for Disease Control and Prevention to begin working on a second vaccine for humans. A top animal health official with the Rome-based U.N. Food and Agriculture Organization said developed countries had responded slowly to bird flu, failing to control the disease in Asia and not doing enough to prepare poor countries, particularly in Africa, for its spread. "In 2004 we said it will be an international crisis if we don't stop it in Asia, and this is exactly what is happening two years later," said Joseph Domenech, head of the agency's Animal Health Service. Four wild ducks found in southern Sweden have tested positive for an aggressive strain of bird flu, authorities said Monday. Tests confirmed the birds carried a highly pathogenic virus of the H5 type, but it was not immediately clear whether it was the deadly H5N1 strain, the National Veterinary Institute said. Two other wild ducks found in the same area near the southeastern coastal city of Oskarshamn, about 150 miles south of Stockholm, tested positive for the same virus last week. Some cat owners in France were panicking last Wednesday that their pets might catch lethal bird flu, bombarding the animal protection society with anxious calls after a dead cat in Germany tested positive for the lethal H5N1 strain of avian influenza. According to the latest WHO figures, the H5N1 strain has killed at least 95 people since 2003, mostly in Asia, and devastated poultry stocks. Scientists are concerned that the virus could mutate into a form easily spread between people, sparking a pandemic. Poland reported its first outbreak of the disease, saying Monday that laboratory tests confirmed that two wild swans had died of the lethal strain. Dr. Margaret Chan, who is spearheading WHO's efforts against bird flu, told disease experts meeting in Geneva to discuss bird flu preparations that the organization's top priority was to keep the deadly strain from mutating into a form easily passed between humans. That could trigger a global pandemic. Since February, the virus has spread to birds in 17 additional countries in Africa, Asia, Europe and the Middle East, she said. "We truly feel that this present threat and any other threat like it is likely to stretch our global systems to the point of collapse," said Dr. Mike Ryan, WHO's director of epidemic and pandemic alert and response. WHO spokeswoman Maria Cheng said experts hope to isolate outbreaks and establish agreements allowing international health authorities to respond quickly, testing viruses and putting in place measures to contain the disease. In Austria, all the cats from the affected shelter have been moved to a location where they will remain under observation. The shelter has been closed, Health Minister Maria Rauch-Kallat told reporters in Vienna. 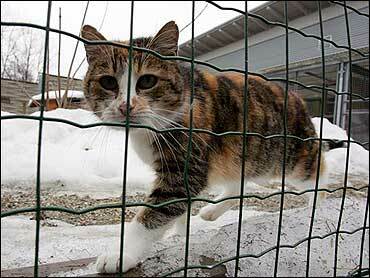 "We have decided to put all the cats in quarantine," Rauch-Kallat said. "Here they will be observed by veterinarians and experts in the coming days and weeks." German authorities last month confirmed that a cat on the Baltic Sea island of Ruegen had succumbed to the deadly virus, which it is believed to have caught by eating an infected bird. That would be consistent with a pattern of disease transmission seen in wild cats in Asia. Austria confirmed the nation's first case of H5N1 in a wild bird last month and has since detected several dozen cases in birds, including 29 in Styria. According to WHO, several tigers and snow leopards in a zoo and several house cats were infected with H5N1 during outbreaks in Asia in 2003 and 2004. Poland announced that the infected swans were found dead last Thursday in Torun, about 120 miles northwest of Warsaw. Samples were being sent to Britain for further tests.